Spring cleaning has officially begun out here. We’ve done a lot of work reorganizing our hay shed. One of the biggest challenges so far was moving the chicken coop. Then I cut a hole in the wall at the back of the hay shed, and we moved our (extremely heavy) Chicken Coop of the Ages to the back of the hay shed. Chickens have paid for themselves! We got our two chickens on 7/30/07 for $10. Now they only owe us the $140 or so that we put into the chicken supplies, etc. They are fortunate that I didn’t charge them for my time I’ve put into building their home. I’ve added the Fourth wall of the chicken coop, and it turned out quite nicely. It’s been quite a project, and I’m almost done… all I have left to build is a roof. I’ll be doing that before it starts to rain and snow for obvious reasons. 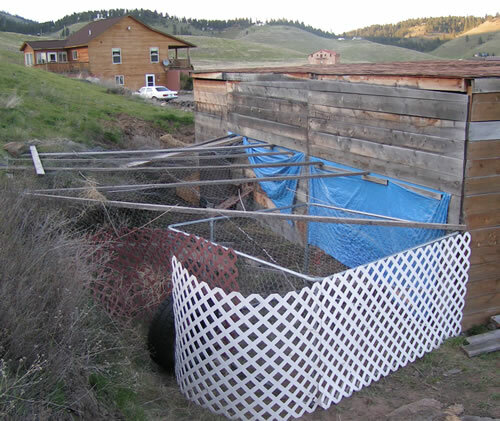 When I first got back from camp, I took some scrap wood, 2 by 2’s and a Sunday, and built a chicken coop. It really was more like a box on stilts surrounded by chicken wire. I’ve spent a little bit of time every weekend adding on, and updating it in the hopes that it will become the coolest chicken coop ever! After a couple weekends of upgrading, we got the chicken coop into place along the side wall of our hay shed, and added some planking, walls, etc. 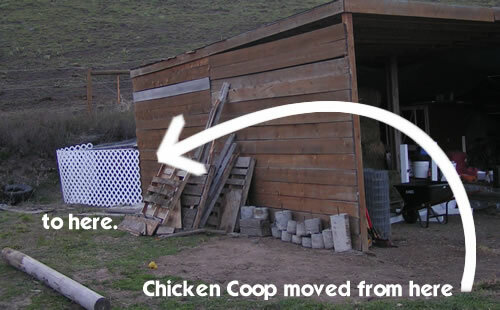 You will notice (above) that the front of the chicken coop is one large door, so we can easily clean it out. 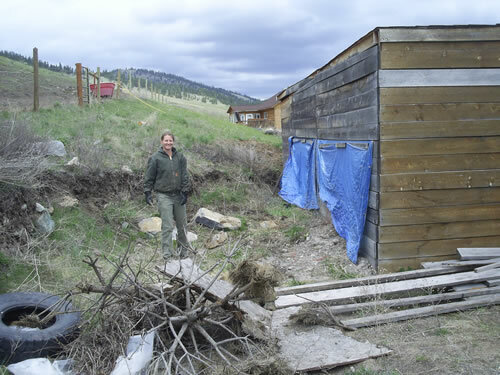 In the image to the right, you can see the side of the chicken coop with a little gangplank I built for the chickens to get into the coop with and a string that attaches from the gangplank to the top of the chicken coop. If you pull on the string it pulls up the gangplank to close in the chickens if we would like to. 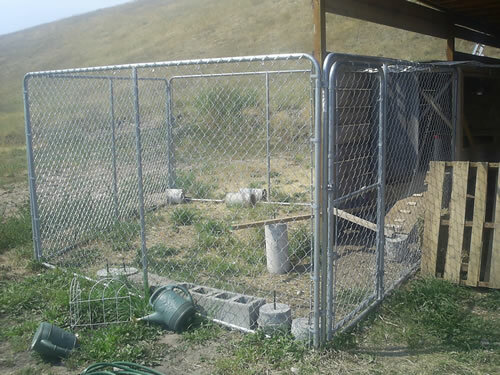 And on the back side, I’ve got a secret door so I can easily remove the eggs without disturbing the chickens, or having to open up the huge door in front. 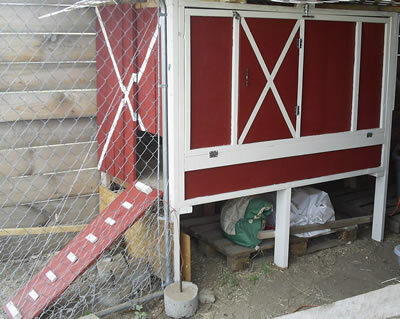 Here is our newly painted chicken coop! Anna picked out the Red color, and I helped with thinking up the design. You can also see a smaller door I created on the front door. (It’s got the “X” on it.) When I added the wood to the huge front door, it became very heavy, so I created that smaller door for easy access. Today, our chicken coop has 4 doors, 3 solid walls, and a beautiful paint job.